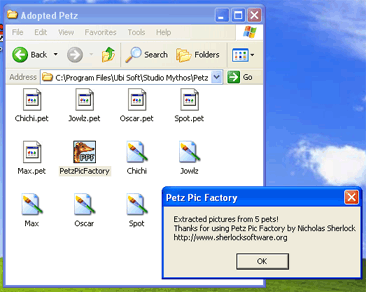 Petz Pic Factory is a small program which automatically extracts the adoption center picture from every .pet and .baby file which is in the same folder as the program. The images are saved as .GIF images with transparent backgrounds. Just copy it to the right folder, double click on it, and you're done! Now exports pictures from babies, too. Now exports the Petz pictures as transparent .gif images. First release! Extracts adoption center pictures from every pet in the same folder as the program as bitmaps.